Your credit rating is an important part of your financial life but not everyone knows why or how it can affect you. To really grasp just how significant it is, it helps to know a little bit more about how credit scores and credit reporting work. Take a look at our quick guide to the ins and outs of understanding your credit rating. Credit reports and credit scores are two different things and your overall credit rating is based on both. A credit report is a detailed accounting of your credit history and it includes a list of all your debt accounts, past and present, as well as information about your payment history, balances and account activity. The most important thing you need to understand about your credit report is that it doesn’t come from a single source. In fact, your US credit rating is drawn from three major credit reporting bureaus that collect information on consumer credit. These are Experian, Equifax and TransUnion. Each credit bureau uses special algorithms to analyze your credit history, which includes all of the items listed on your credit report, to generate your credit score. In a nutshell, this a number that’s designed to represent your overall financial status. Credit scores come in several different flavors but the most important ones you need to be concerned with are FICO scores and VantageScores. FICO scores are generated by the Fair Isaac company and they’re the ones most often used by lenders when making credit approval decisions. VantageScores were created by Experian, Equifax and TransUnion as an alternative scoring model. Both range from 300 to 850, with 850 being the best score possible. What is the credit rating definition and how are credit ratings used? Your credit rating is what banks use to decide whether to approve you for loans or lines of credit. Specifically, lenders use your credit score to gauge how responsible you are when it comes to things like paying your bills on time and keeping debt to a minimum. Again, this all goes back to the information that’s listed on your credit report. When you’re applying for a credit card, personal loan, car loan or mortgage, it’s your personal credit rating that banks consider. That means they’re only looking at your personal financial details, such as how many other debts you have, whether you’ve had any late payments and whether you have any major black marks like charge-offs or collection accounts. On the other hand, if you’re in search of a business loan or credit card, lenders may consider your business credit rating instead. The three consumer credit bureaus also generate business credit reports and scores but you can also establish business credit through Dun & Bradstreet. If you go that route, you would get a DUNS score, which is based on your business’s track record for credit use. If you own a small business, you may be tempted to use your personal credit to obtain loans or lines of credit but this can come back to bite you. Unless you have an established business history and a solid cash flow, most lenders are going to require you to sign a personal guarantee. If the business folds, that allows the bank to lay claim to your personal assets if you default on any business debts. Not only that, but it puts your personal credit at risk as well. Missing a payment on one of your business debts can knock as much as 100 points off your personal score, making it harder to get new credit in the future. Fortunately, some lenders and creditors are relying less on personal credit these days to judge the financial soundness of a business. As a side note, we should remind you that while banks utilize credit ratings, they’re not the ones that create them. When you’re checking your credit report to get a loan with a particular bank, for example, you shouldn’t think of it as checking your Bank of America credit rating or a Wells Fargo rating. Instead, the lender’s looking at the credit reports generated by the credit rating agencies and the corresponding scores. “Good” versus “poor” credit isn’t all that informative if you want to gain a better understanding of your finances. In the broadest sense, good credit is anything that qualifies you for a loan at the best interest rates. Bad credit is anything that causes you to be denied for credit or pay the most in interest. This credit rating scale shows that there are different levels of credit but the numbers alone don’t paint the whole picture. To really understand what good credit is and why it’s so important to have, you need to dig a little deeper. Let’s assume you want to buy a home and you have a 700 credit score. That puts you in the “good” category which means you’re more or less be a lock for a loan and you’re going to get some decent interest rates. That sounds pretty good, right? In reality, there’s a fine line between a “good” score and an “excellent” score. Even though the difference may be apparent right away, looking at it from a cost perspective can be a huge motivator to strive for a higher number. Here’s an example. Say you find your dream home and you need a $250,000 mortgage to seal the deal. You take your 700 credit rating to the bank and they approve you for a 30-year loan with an interest rate of 4.5%. When it’s all said and done, you’ll pay more than $206,000 in interest charges to clear the mortgage. Now, let’s say you were to really push to bump up your score and you got it to the 750 mark, which puts you in “excellent” territory. Now the lender’s offering a 4.1% interest rate. Not a huge difference at first glance but when you calculate the total cost to pay off the mortgage, it adds up to a savings of more than $22,000. On the other side of the spectrum, a lower score would add thousands of dollars more onto the final total. For instance, if you have a “fair” score of 675, the lender might only go as low as 5% on the interest. In that scenario, the total interest charges would come close to $230,000 which means you’d effectively be paying almost double for the home. A “poor” credit score that falls in the 550 to 649 range would make it even more expensive to borrow money. If you’re stuck with a “bad” credit score of 549 or less, good luck even getting approved for a loan and if you are, you can bet on it costing you where the interest is concerned. Even if you’re trying to do something as simple as get utility services in your name, you’ll likely have to fork over a big deposit because of a bad credit rating. Bottom line, the higher your credit rating, the more responsible you’re going to look to lenders. The more responsible you are, the less risk you pose and your financial savviness will pay off when it comes to getting the best rates. Now that you’re armed with a working knowledge of credit ratings, why not find out how yours shapes up? 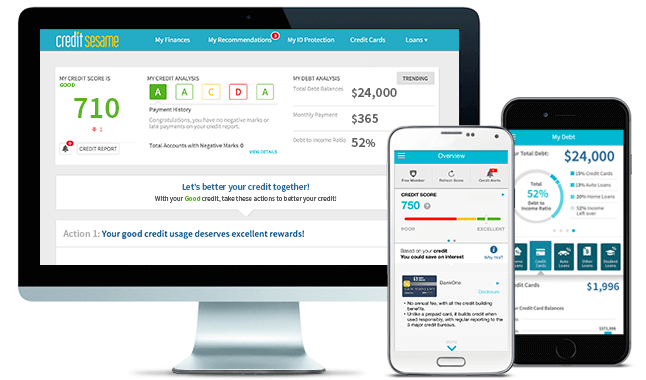 Credit Sesame works with TransUnion to offer you a free credit rating based on your financial situation. Using all the tools and resources available to you can be a big help when it comes to keeping your finances—and your credit—on track. I needed to check credit rating so I signed up for Credit Sesame. Even though I have never had any debt or late payments, and my report should be perfect, I still don't have a perfect score. I'm chalking this up to my short credit history. If that's the case, what is the best credit rating I can get without having a long term history of credit? I have a fair credit rating score of about 710. I have accumulated a lot of store charge cards over the years and want to clean up my accounts a bit. I am thinking of consolidating and closing down some of my accounts. But does cancelling a credit card hurt your credit rating? I need to know whats my credit rating got to do with employment. I have been applying for jobs and my most recent interview ended with the employer asking me to sign off that he could pull me credit report! Is this even legal?? In the credit rating table provided in this article, is it safe to say the average credit rating for people in the US is within the "fair" category?